Know how to get your questions answered by the Pathwright guidance team. Your Pathwright account is equipped with a messenger button in the lower right corner. Open the messenger to contact our guidance team (customer support) any time. Ask your question and we'll get back with you as quickly as possible during business hours. You can also click the messenger button right here in our Help Center (if you do, just be sure to leave your email address so we can get back with you). Prefer to email? Contact us at hello@pathwright.com. Our business hours are 9 AM to 5 PM ET Mon-Fri and we're usually able to respond to questions in one business day or sooner. Need a quick answer now? Use the search bar above to search for an answer. If you don't find what you need, let us know! You can click the chat button here in our Help Center in the lower right corner. Be sure to leave your email address so we can get back with you. Register in one of our free courses at https://grow.pathwright.com/library/. We offer a weekly live demo where members of the Pathwright team are available to give you a personal overview of Pathwright and answer any questions that you have. Register in the next live demo here. 🤔 Why do we do it this way? Q. Do you have a phone number? Pathwright offers free, friendly in-app message and email support to administrators at hello@pathwright.com from 9 AM to 5 PM ET Mon-Fri. We're usually able to respond to questions within one business day or sooner. First, writing out a response allows us to to offer quicker, detailed responses that are tailored for you based on your account details. Written responses are easily referenced afterwards while phone conversations tend to get lost (and then repeated). 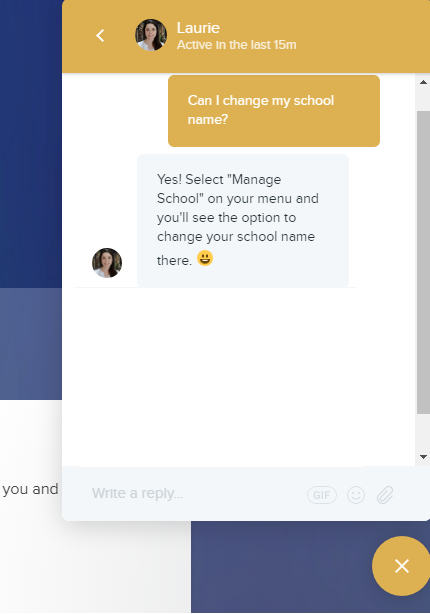 Written responses can easily link to support documents, pages in your school, screen casts and images, and external websites. It allows us to work together as a team to provide you with the most relevant answers. Q. How can my learners get help? Our Tips for learners collection is full of up-to-date articles that help students use all the features of the platform and easily find answers to questions. Our free Learner Guide course will help them make the most out of the learning experience. 💡 Pro tip: if you'd like to customize the Learner Guide for your members, just let us know and we'll copy it into your account for you to edit and share. If one of your learners has a question they can't find the answer to, they'll see a "Need help?" link that opens to the email address you have set under your account support settings. Often, questions can be resolved by helping your learners log in correctly. If they ask you a technical question you don't know the answer to, just forward that along to hello@pathwright.com and we'll help you resolve it. See How to report a technical issue.